“Hi Layla, my name is Brier and I follow you on Pinterest. I noticed that you pinned a sliding barn door photo. I really love that look and wanted one for our hallway, but barn door hardware is expensive, man! I tried to justify spending twice what we paid for the door itself on the hardware, but that didn’t fly. Luckily for us, my husband is a genius! Ours doesn’t quite have the “barn door” look, but I think it’s pretty and it was a whole lot easier than ripping out a wall to put in a pocket door. First, he got a piece of double track (the kind that’s attached to the top of mirrored sliding closet doors) and separated it in half- so instead of two tracks, there was only one track. (I don’t actually know if you can buy a one-track…um, track…but, if so, that would be easier). 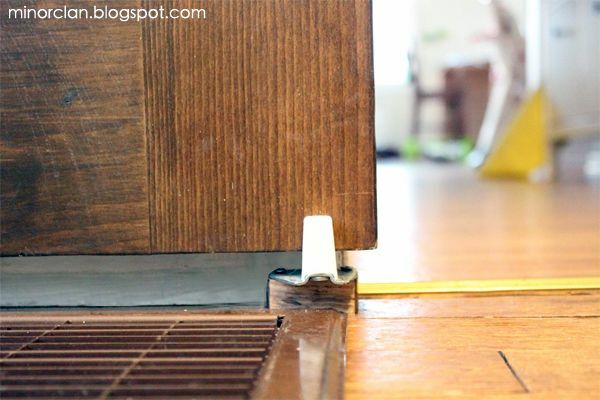 Next, he spray-painted the track flat black, and mounted it to the bottom of a 2″ x 6″ piece of wood that he distressed and stained to match the door. 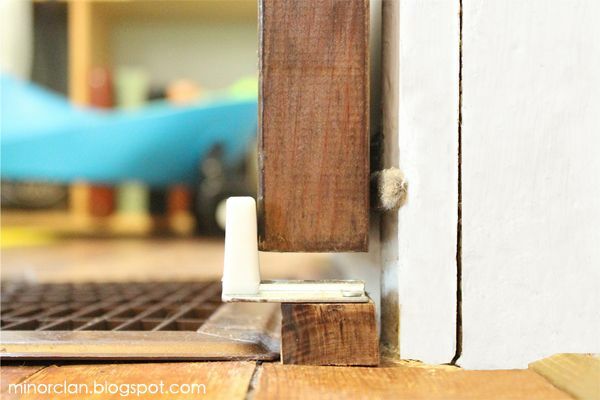 After that, he mounted the 2×6 to the wall above the door frame so the door would stick out far enough from the wall to get past the door frame molding. Then, he attached the “cars” (the rollers that fit in the track) to the top edge of the door, and slid it into the track. Thanks for sharing your project with us Brier. We’ll definitely be trying it out here at TLC when we get around to working on our master bathroom door project! 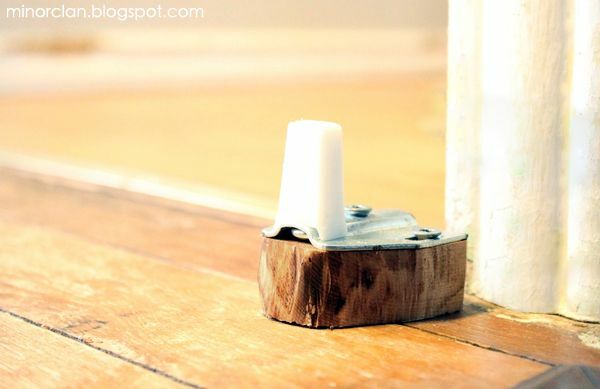 Great idea, perfect answer to a narrow hallway that my current door opens into, with the door gone, hallway gains an inch or so, and the door knob that’s always catching pockets and ripping pants would be gone! Just so in love with this idea. Always looking for ingenious DIY projects! I actually just installed sliding barn doors in my house as well. I found a kit at Home Depot specifically for this purpose and with the premade door it was all less than $60. Hey Juleen, I’m totally planning this project for my office, would you mind sharing a few more details? Did you find the hardware in the closet section? I have home depot and Lowe’s here where I live, and I’d LOVE to know how you did this!! What a clever budget friendly solution! We were lucky enough to find barn door hardware on Craig’s List (2 tracks for $30) and install a sliding door in our dining room but I love this idea … I have a laundry room with no door. Thanks for sharing! Thanks for sharing. Whant to do this for my bathroom. We have a pocket door now but it keeps falling off the rail and sticking such a pain. You inspired me! We have since put in a double pair of french doors ($20 each from the habitat reuse store) that i frosted with window film ($18 from lowes) and i now finally have bathroom doors!!! The whole project cost me around $120 including paint and door pulls. I have painted the wood support beam the same color as the wall and it just about disappeared. Thank you for giving me much needed privacy from the prying eyes of 2 kids. 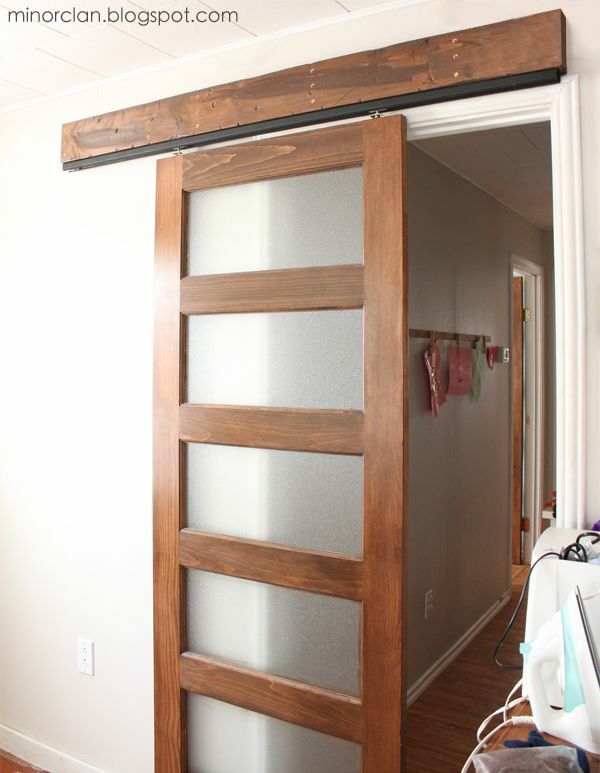 Thank you for sharing – we have been looking for a barn door for our closet – will be doing this instead! Awesome idea. Thank you again! Just used your idea ! We have a small bathroom and this really works….looks great…bought the hardware at Lowes for 13.98 ! Diane, thanks for sharing! I’m so excited to try this for my office! I am remodeling my bathroom right now and I was trying to explain to my husband what I wanted for a door. This is it. Thank you !!! I also found a single track and roller on TractorSupply.com. Not sure if the price is lower than the double track (split) but it was definately less than commerical sliding door hardware. Thank you SO much for this brilliant How-To. My version went up today saving me big bucks. We used an inexpensive flat door, then covered both sides by designing and installing a laminate flooring. Very cool. Thanks again. This is super awesome! I so love this idea. The only thing I might do different is to remove the crown molding from around my doorway. Of course I’ll have to paint the underneath of wall but that’s just a great excuse to update the room’s color scheme. Thanks for the idea and how-to! 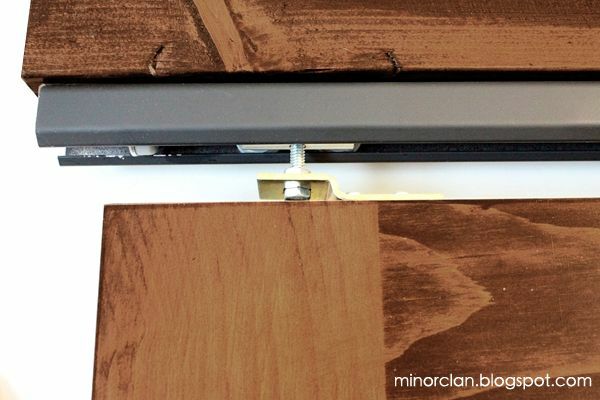 If you used a heavy piece of crown molding turned upside down to receive the hardware setup, the top would be really unusual, and still come out far enough to clear the door frame. I can think of a lot of different ways to address this to make it take on different house styles and still maintain the whole “Barn Door” flavor. Thanks for the tutorial!!!! Love the idea for hanging the door. I’m doing this myself soon for a finished basement. Like you guys, I found the barn door hardware to be outrageously priced. Where did you guys get the track from? Great look! 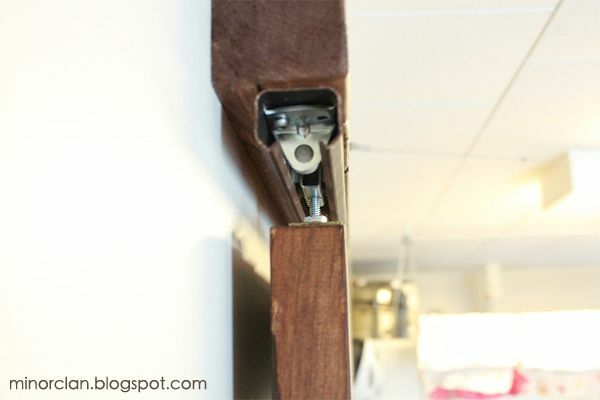 You can even hide the upper hardware track if you want by offsetting a second piece of finished wood an inch and a half down, finished the same as the piece that is holding the track but perhaps not quite as thick dimensionally. Does anyone know where she bought the actual barn door though? LOVE the hardware tutorial…thanks! This is awesome! Where did you get the double track though? My dad is doing a project like this for me, but we can’t seem to locate the double track piece. Here is some hardware that might be helpful. We haven’t tried this just yet, but I will be either ordering the $30 from Amazon or the $80 from the other site. we are puting a glass door at the top of the stairs for light on the stairway and this will be perfect! what a fabulous idea, and totally within my DIY budget and ability. Thanks so much, Brier and Layla! was the door handmade too? If not , where did you get it? Thank you so much for sharing this. It is exactly what I have been looking for. I have an odd sized closet opening in a room too small for a swing-out door. I have seen other, similar doors, but this appears to be the simplest installation. This is awesome. I have looking for an alternative to pocket doors for our “entertainment” room. Thanks. I love this Idea! mt husband and I are selling our current home which is WAY too big and rebuilding else-where. I really like this idea because we are building much smaller. This will help save space. Thank goodness I found this. We currently have a master bathroom with no door. It really bugs me. This is exactly what I wanted to do to separate the bedroom from the bathroom.